Mouser Electronics, Inc., the authorized global distributor with the newest semiconductors and electronic components, is now stocking the G.hn Wave-2 networking chipset from MaxLinear, featuring the G.hn digital baseband and G.hn analog front ends. Offering physical data rates up to 2 Gbits per second (Gbps) across a variety of physical media, the Wave-2 networking G.hn processors deliver reliable connectivity and reduced congestion in smart grid, security, broadband, industrial, smart home, and automotive applications. 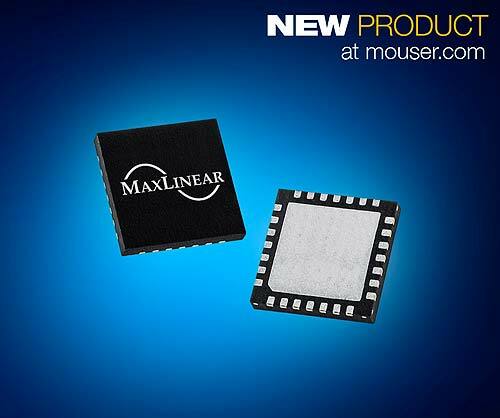 MaxLinear’s G.hn Wave-2 networking platform, available from Mouser Electronics, offers designers the flexibility to combine footprint-compatible components to address multiple G.hn applications. The MaxLinear G.hn digital broadband (DBB) processors provide high-speed networking solutions with 1 Gbps maximum throughput over power lines and 1.7 Gbps maximum throughput over coaxial cables and phone lines. The DBB processors feature a G.hn physical layer (PHY), G.hn datalink layer (DLL), and an embedded CPU for management and control functions. The G.hn analog front ends (AFEs) provide up to 2 Gbps physical data rates over any wired medium. Housed in a small 4 × 4 mm QFN package, the devices deliver programmable transmission and reception gains for each wired medium. MaxLinear’s platform includes a set of software development kits (SDKs) that enable designers to create custom solutions that meet requirements such as IPv4/IPv6 support, quality of service (QoS), and TR-069 management. Engineers can also use the SDKs to develop customized applications that run on a DBB processor’s embedded CPU. Mouser is also stocking three G.hn Wave-2 Networking Evaluation Kits, for a power line, coaxial, or phone line medium. Each kit includes a DBB processor, AFE, and two evaluation boards that allow designers to evaluate the performance of G.hn networking technology. To learn more about the MaxLinear G.hn DBB processors, visit www.mouser.com/exar-ghn-digital-baseband-processors. For more information on the G.hn AFEs, go to www.mouser.com/exar-ghn-analog-front-end-processors.